Nancy Teramura Hayata will again perform Japanese classical dance at the OC Cherry Blossom Festival. 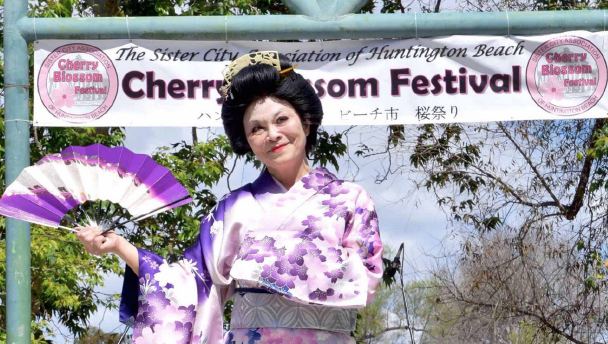 HUNTINGTON BEACH — The OC Cherry Blossom Festival returns to Huntington Central Park, 7111 Talbert Ave. in Huntington Beach, on March 15-17 for an annual celebration of Japanese and Japanese American culture in Southern California. This free event is expanding to three days in 2019 — Friday from 5 to 9 p .m., Saturday from 10 a.m. to 9 p.m. and Sunday from 10 a.m. to 4 p.m. Enjoy a fun-filled weekend of music, dancing, contests, live entertainment, 50+ vendors, 25+ performances and much more. Plus, the Sakura Night Market will kick off on Friday and Saturday evening, when the whole park will be lit up with excitement, food, drink, and entertainment. Since its inception, the festival has been inspired by and helped to fund an international student exchange program between Huntington Beach and its Japanese sister city, Anjo, Aichi Prefecture. For more information, visit www.occbfest.com.